The majority of apps, websites and software now have some form of analytical data tracking implemented. The reason for this is quite simple; by understanding exactly how your website is used you can begin to make data-driven decisions that enhance your user’s experience. When you really drill down into your web analytics data and truly understand it you can optimise everything from usability and design right down to content and media. Simply put, good analytics involves knowing where you are now, where you have been, where you are going, and where you want to be. Location – this could be city, country or even continent. Device – are users more likely to be visiting your website on a tablet, phone or desktop/laptop? Behavioural – when are users visiting your website? What time/day? Identifying your existing audience, for example clients or customers, can really help you to pick your ideal audience. Who are your best clients/customers? What are their traits? How do they fit into the above criteria? Understanding this can really help you to position your website in a way that appeals to similar people. The answer often given to this question is along the lines of “To increase enquiries”. I would argue whilst it is an important goal of the website, it is not its purpose. Your website can do so much more than just “increase enquiries”, for example a much more meaningful purpose would be “To position company X as an industry leader through accurately presenting its knowledge and capabilities whilst increasing digital visibility and presence.”. With a clear purpose based on your business’s values and USP, you are more likely to attract and convert your desired audience. If you already have a website, a useful activity would be to look at what purpose it currently serves from a users perspective. A user might not see your website in the same way you do, and it could be having a massive impact on your goal conversions. Keep clients/customers up to date with industry news – this could be measured through emarketing campaigns and blog traffic. Increase presence on social platforms – simply measure user engagement and shares on social platforms. Increase enquiries from X audience – measure telephone, email and website enquiries that fit your ideal audience criteria. Reduce cart dropouts – measure the percentage of users that are abandoning their carts (Using a tool such as Google Analytics). Increase sales of product X – simply measure sales of a specific product. A clear set of goals help you to mould your website’s content, design and functionality. Once goals have been established and you have accurate ways of measuring them then you can really start to leverage your analytics data. If a specific product is not selling then your data will help you to understand why, and then you can look at how you can increase the product’s visibility and sales. Cart dropouts could be increased by, for example, offering free shipping to orders over a set value. Once you can get an accurate read on your analytics data, seeing who your current audience is and how they use your website. 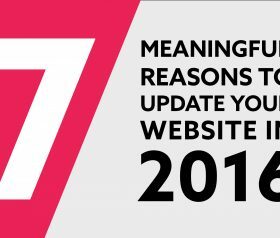 You can begin to modify your site to reflect this and over time steer your website into driving the goals you want to meet. Often the smallest changes can make the biggest difference, and your web analytics is there to give you the insight you need to do that.